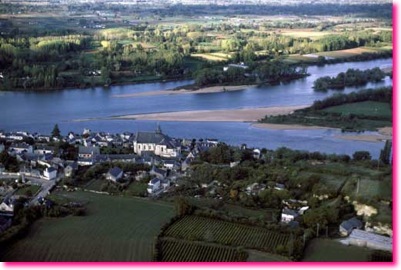 On December 2nd, 2000, l'UNESCO inscribed the central part of the Loire river valley, between le Maine and Sully-sur-Loire, on its prestigious list of World Heritage sites. The Loire, the longest river in France, is also the last free-flowing river in Europe. The river runs in accordance with nature's rhythm. Unlike any other river in western Europe, there are no dams or locks creating obstacles to its natural flow, except far upstream. This exceptional situation allows for a great variety of semi-humid environments (which are incidentally in danger of extinction on our planet) over the length of the river. It also benefits the numerous animal and plant species that live in and along the river. The diversity and rarity of some of these species are absolutely remarkable. 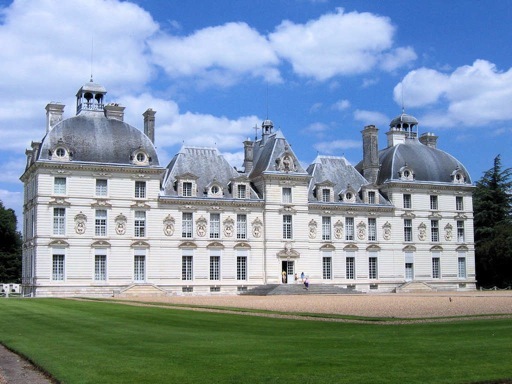 The landscape of the Loire valley, and in particular its many monuments, evoke the ideals of the Renaissance and the Enlightenment on western European thought and creation to an extent that has never been reached before. 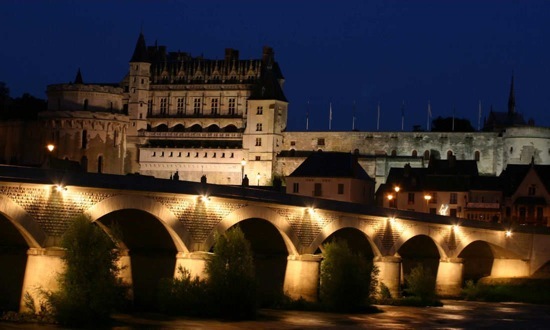 Two years ago, (1999) the Loire Valley failed to make the UNESCO list. The presence of the Saint Laurent nuclear plant (and three others out of the perimeter and farther upstream) and the great number of high tension wires dissuaded the jury. This time, a more consensual layout defining the area to be included on the list, won the commission's favor. The report from the committee's 24th session recognizes that the Loire Valley, "is an exceptional cultural landscape, of great beauty, comprised of historic cities and villages, great architectural monuments - the Chateaux- and lands that have been cultivated and shaped by centuries of interaction between local populations and their physical environment, in particular the Loire itself." 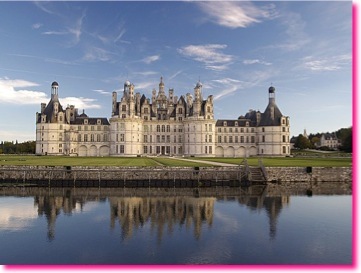 The Chateau and Estate of Chambord, previously inscribed on the WHL is now part of the Loire Valley. The major city is Tours (train station St Pierre des Corps). Several fast train are available from/to Paris (station Montparnasse), daily. This is a one hour trip only*. *The price for a round trip, 1st Class, is roughly 200€, 120€ in 2nd Class. Motorway A10 (E05), direction Chartres/Nantes/Orleans/Bordeaux, Exit 21, Tours Centre, then you should follow the direction Amboise. This is a 2:30 hours trip by car. The price for a full day of 10 hours is 1200€ with a sedan Peugeot 607 or 1600€ for 7 passengers WV Caravelle minivan. Drivers are professional, selected for their enthusiasm, personality, spoken languages and driving skills. They are intensively trained in advanced touristic knowledge. 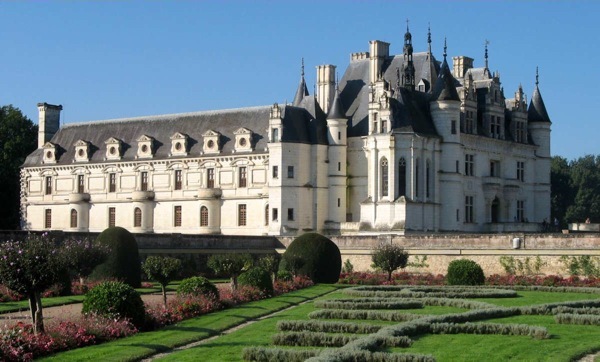 Arriving in the Loire valley you begin your “Renaissance” day tour with a visit to the royal Château d’Amboise, the favourite residence of the French court in the 15th century, where you will see the tomb of Leonardo da Vinci. Then you visit Clos Lucé, the house given to the great artist by his patron King Francis I and which contains many models that illustrate his genius. 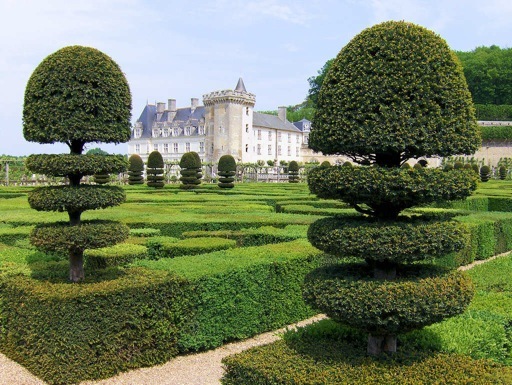 After lunch (drinks included), drive to Chenonceau to visit the château de Chenonceau and its gardens. This chateau, which straddles the river Cher, is also famous owing to the influential women who lived there, including Catherine da Medici and Diane de Poitiers. 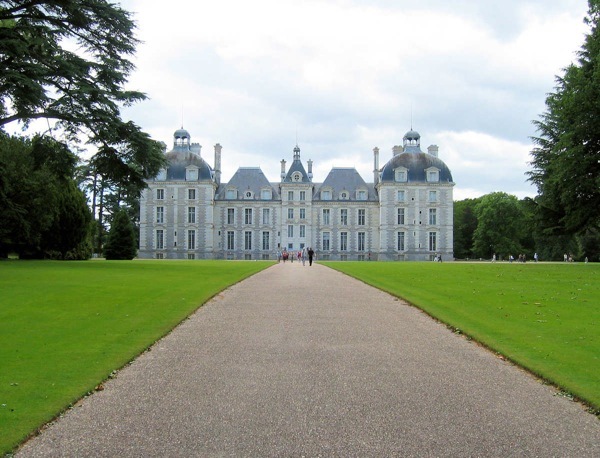 Finally, drive to Chambord for a stop and a panoramic view of the royal château. We are used to work with great driver-guides, specialist of the Loire Valley region (Castel and Vineyard). A guide can pick you up at the train station (St Pierre des Corps) and drop you off at the end of the day, for your return train to Paris. Vehicles are adapted to all requirement (Sedan, Minivan...). The price for a full day is 500€ (9.00am to 7.00pm) or 350€ for a 1/2 day (2.00pm to 7.00pm). Those rates do not include entrance tickets to the castels, and do not include the train tickets Paris/Tours. The region defined as the "VAL DE LOIRE" begins to the West with the muscadetsand gros-plants in the region of Nantes and ends in the East, up river passing through the coast of Auvergne and St-Pourçain. To the north, you will find Jasnière andOrléanais wines and to the South fiefs vendéens, Châteaumeillant and Haut-Poitou wines. Construction began on the Chateau de Chaumont in 1466 under the direction of Charles d'Amboise, and was continued by his two sons (both named Charles!). The Chateau was built on the site of a former fort that was destroyed by Louis XI. Catherine de Médici bought Chaumont when her husband Henri II died in 1559. 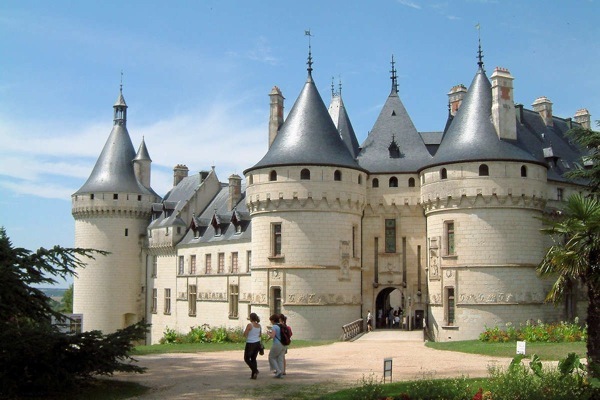 She had probably already been living there for some time, while the King found it more pleasant to "visit" and lodge at Diane de Poitiers' (more than twenty years younger he was, oh la la!) residence at the Chateau of Chenonceau. Later on, Catherine de Medici forced Diane de Poitiers to trade chateaux. Thomas Becket owned the Chateau before he was murdered, as did Pierre d'Amboise and his children with brilliant destinies. Mme de Staël was exiled there by Napoleon, and Mary Say, a rich heiress, lost everything there. Access to the chateau: on foot by taking the ramp which crosses through the park. Gorgeous cedars! Easy parking on the street. Built at the junction of the Loire and the Thouet rivers, the former Carolingian city is known for its fortifications built by Thibault, the Count of Blois, in the 10th century. In 1026, the town passed into the hands of the Count of Anjou, the famous Foulques Nera and then on to his plantagenet heirs. Philippe Auguste, the King of France and a Capetian brought into the hands of the crown. Whatever road you take to get to Saumur, it's the chateau that you will appreciate first. After the fort became French, in 1227, it was rebuilt by Saint Louis. After 1367, Louis I of Anjou began replacing the round towers with polygonal shaped towers (these two stages in its construction are still visible today). King René of Anjou, " Bon roi René ", a cultivated man, talented writer and fortress builder (Tarascon) improved the general level of comfort of the entire building. In the 16th century, the Italian Bartolomeo strengthened the fortifications of the chateau. Ahead of his time, he had fortifications built around the medieval chateau that were low to the ground. These bastions and "courtines" were built in a star shape that was extremely modern for its time and a whole century before Vauban did almost the same thing. In a less glorious time in its history, the chateau became a prison under Louis XIV and Napoleon. At the beginning of the 20th century, the city bought the chateau from the State and began to renovate it progressively. Built between the 15th and 16th centuries under the successive reigns of Charles VIII, Louis XII and François I, the château d'Amboise was one of the very first Royal residences. The very prestigious chateau, combines both Gothic and Renaissance style architecture, and contains a very beautiful collection of furniture. The spirit of Leonardo da Vinci still haunts this place. It is thought that he is buried in the Chapelle Saint-hubert in the chateau, an example of flamboyant Gothic architecture. The panoramic gardens provide a beautiful view of the town of Amboise below and of the Loire Valley. The Chateau is accessible on foot by going over a long ramp from the pedestrian streets in Amboise. These narrow and lively streets, like the one under the clock tower, protect visitors from the noisy commotion of automobile traffic, which one cannot avoid on the boulevard that borders the Loire. But this is not the way we chose to get a view of the chateau.. Instead, we decided to get a good look at the chateau from the'île d'Or, in the Loire, facing the city, which provides the best view of the chateau. If you would like to photograph the entirety of the chateau (like the photo above), hop into your car and go to the Island. Crossing the Loire on foot over the bridge is extremely dangerous. There are no pedestrian crossings, and the sidewalks are ridiculously narrow. 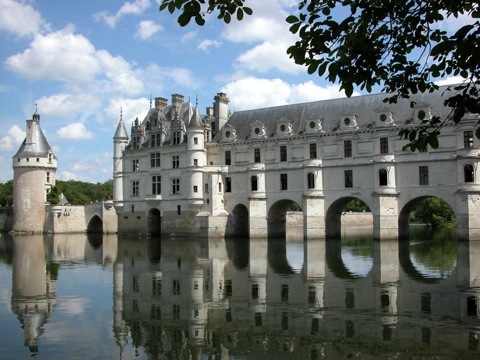 The elegant barrier built across the Cher river, the Chateau de Chenonceau is a jewel of Renaissance architecture. 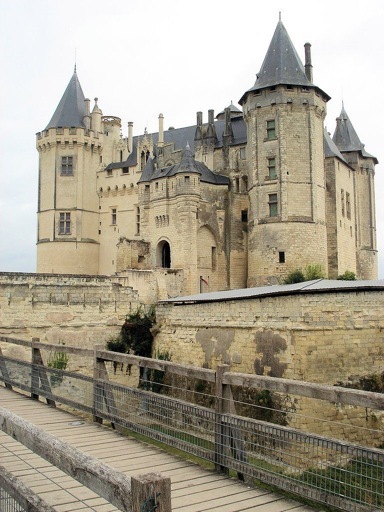 Built in the 16th century, it owes its development to two women: Diane de Poitiers, Henri II's mistress, who was given the Chateau to live in by the king, and Catherine de Medici, his wife, who, when he died in 1559, forced her rival out of the Château. Catherine had the three story gallery built on the bridge that spans the Cher. Don't tell us this building doesn't remind you of something! Well? Tintin, Hergé... Captain Hadock's Chateau. Got it? Built on the left bank of the Cher river around 1532, by Jean le Breton (François I's Secretary of State) on the former site of a fortress from the 12th century ( of which only the dungeon is left and which was restored in the 14th century), Villandry is the last of the Renaissance Châteaux in the Loire Valley. A bridge over the moat takes you to the three buildings that surround the main courtyard. Further along, the moat becomes a canal which irrigates the famous gardens that have been restored in the spirit of the 16th century. The classical style outbuildings were built around 1754 by the chateau's new owner the Marquis de Castellane, ambassador to the King..
Dr. Carvallo, the last owner, began restoring the gardens in 1906 and made the Chateau accessible to the public for its interesting collection of Spanish and Italian paintings, the superb hispano-mauresque ceiling, and the numerous pieces of furniture from the 15th and 16th centuries located inside, in the left wing of the chateau.